Noob looking at future mounts for AP. Just getting into Astronomy and AstroPhotography. I'm a photographer so I have a bunch of Nikon bodys and lenses I want to use for astrophotography. I was initially looking at the Celestron AVX but heard some not so great things about it so I decided to go the cheaper/mobile route for my first rig. The iOptron SkyGuider Pro. Just so I can dip my toes into the AP world. Very excited to get it and try it out. I've seen great results from people using that mount. I'm now curious just looking down the road as a next upgrade that I can get use lenses or a newt/refractor on. I'm interested in the Sky Watcher AZ-EQ5 ToGo. Looks like it can hold a decent weight and has PPEC which I know is good for long exposure photography. I know I probably can't go very big with a newt since they are pretty heavy but it looks like a good option for variable optic platform. Plus it's not absurdly expensive, which makes it doable for me. I know this hobby is a money pit but I'd like to get some thoughts on my mount choice for what I'm trying to do. I really don't want to drop $1,300 in the future on a mount I can't use with various Optics or I may grow out of quickly. I also know gear choice depends on what kind of AP I want to do but I'd like to be able to do wide and deep space AP. So since I'm a noob to all this I'd love some input from the ladies and gents of the community. This seems to be a wealth of knowledge here on this forum. Before you do anything else, join your local club and see what people are using. Buy a copy of the Deep Sky Imaging Primer and read the first 100 pages. Once you've done those two things you will now be an informed consumer. It's way too easy to overestimate how difficult deep sky astrophotography. At the same time none of us here at CN know your skill set or use cases. For example, will you be setting up in your backyard or driviing 100 miles and camping for a weekend. If the former then weight might not be very important, if the latter it might be crucial. In your backyard you should have power, you won't at many dark sky sites so a battery is necessary and a system that draws less is desirable. Just a few things to consider. At least I can see that you understand that the mount is the key. The other piece of advice you will get is to start with a short refractor which, because of the short tube is easy to balance and guide. Second what Ross is advising you!!! Can't stress the importance of joining an astronomy club and asking questions directly to them and seeing what they use in action. Take your time in your research. Fully understand what is on the market. In other words, fully explore options, even those you now would not think to spend a lot of money on. While you are doing research, fully explore astrophotography imaging and learn the process. It's a steep process, with many options. Again, fully explore all the options so that you get an understanding of what is available, for image acquisition and image processing. I get the sense you are already starting to look at CN, which is good. I can expand on any point here if you like, but figure for now, this is a good place to stop at this point in the conversation. Thanks for the info I'll definitely pick that book up. I live in statesville, NC pretty decent skys(light pollution wise) in my backyard and at my friends field a few miles away. I'll also try to find a local club. I would definitely love seeing what people are using and getting to see some gear in person to get hands on before making a decision on something. Is that kind of local community center thing as far as clubs or do local clubs have forums? Sorry, child of the internet speaking here. Out of my comfort zone here. There's a really good club in the Statesville area and another one in Maiden, NC, of which I am a member (Catawba Valley Astronomy Club). 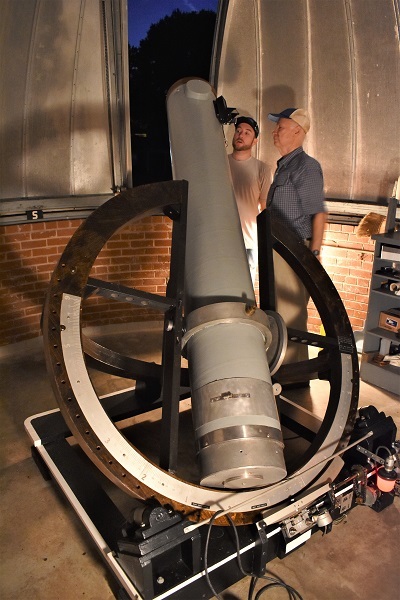 Many of the guys in the Statesville club (Piedmont Amateur Astronomers,https://nightsky.jpl...cfm?Club_ID=261 ) interact with us, and vice-versa. Take a look at https://www.catawbasky.org for our schedules and programs. We have public viewing 1st and 3rd Friday every month (next night is Feb 15) and are open regardless of the weather those nights. Come join us, we have a fantastic selection of telescopes (mostly Dobs), we have the 4th largest privately owned telescope in NC there, a 25" f/5 Dobsonian, and our observatory is the only free standing high school observatory in the state. The dome has a 10" f/9.2 Newtonian, hand built in the 1950's, including its split horseshoe equatorial mount. Edited by Luna-tic, 11 February 2019 - 04:11 PM. Man that's awesome, can't wait. I'm definitely coming out! It's only 35 mins from me. Hopefully I can meet some people and get some info.